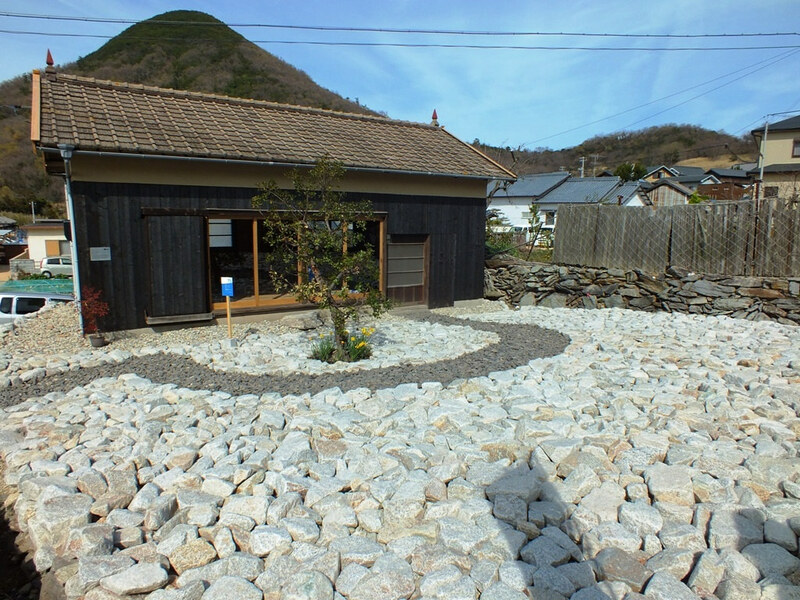 For today’s Setouchi Triennale 2013 work of art, we’re going to do things a little differently as I’m not the one who is going to tell you about Sunset House: Language as the house of Being, a permanent artwork located in the village of Kōnoura on the Mito Peninsula of Shōdoshima. James Jack, the artist, will comment on the artwork in a short interview that he kindly gave me. I am an artist born in America and have been based in Tokyo for the most part since 2008. I work with the history of place and the realities of society in my artworks. I rely on the richness of that which can be found in the immediate environment around us now. 2. How did Sunset House project start? How did you get involved with the community of Kōnoura? I went on a tour of the islands that were to be included in the first Triennale in 2009 and was deeply moved by the region. Something about the relationship of macro and micro, past and present, presence and absence stayed in my mind. Among the meandering pathways the stone walls made of local materials made a strong impression on me. 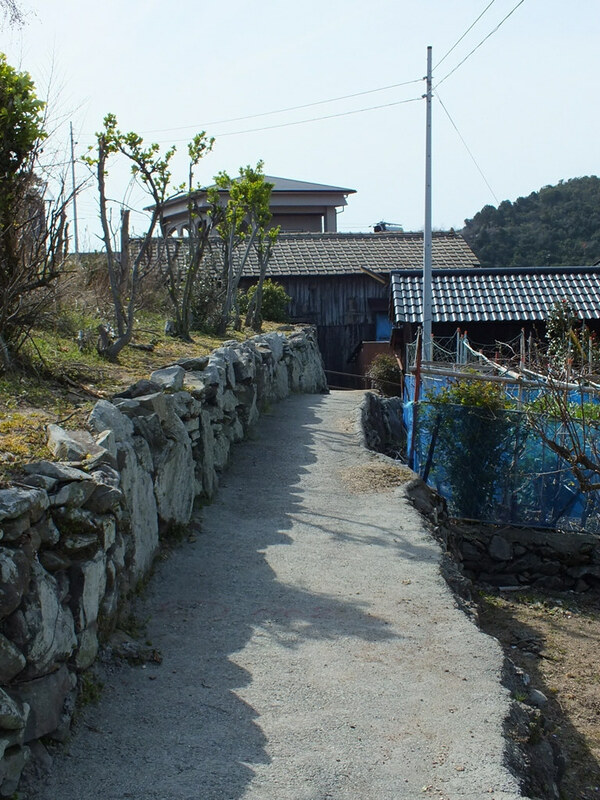 I remember one wall on Teshima where the stones were carefully placed one next to the other at an angle in rows to make an eloquent pattern as the wall gradually curved to follow the pathway. The arc form of the stones lined up together was so simple and yet so profound. Also the people I encountered were incredibly welcoming. 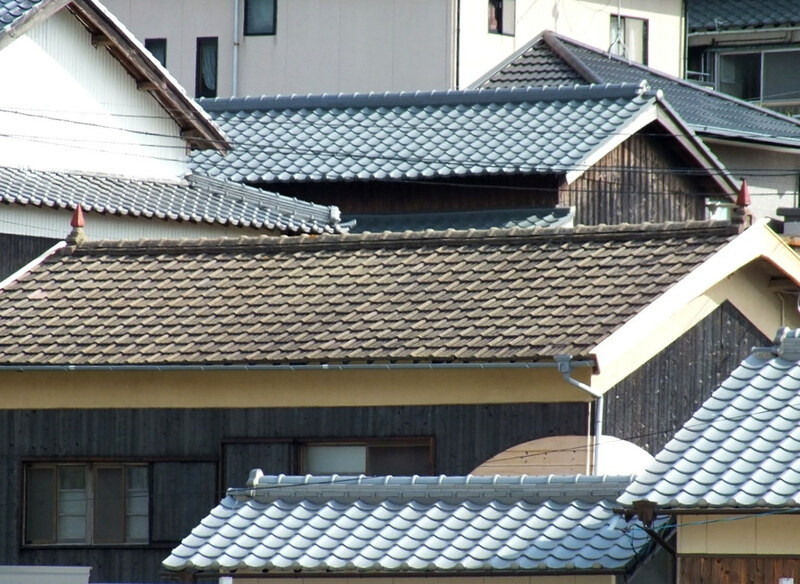 I was invited by the town to initiate a work on Shōdoshima and I was immediately struck by a small shed in the town of Kōnoura. My work there began in summer 2010. 3. Can you tell us about Sunset House? Its genesis? My first impression inside the shed was that the walls were full of stories. They were rough dirt walls with raw grass (wara) sticking out. I could feel the time that had passed since the space was inhabited in the rust spots that had seeped into the inside of the walls from the nails outside. I had a strong feeling that memories, stories and emotions were all seeping out of the cracks in the dirt walls. I have used dirt in my other artworks such as Philosophies of Dirt so I was sensitive to the potential of this raw material. I was fascinated by this simple, one-room shed that had fallen out of use so I chose it as the site for my artwork. As I continued to work there over the past three years I feel it may have chosen me. 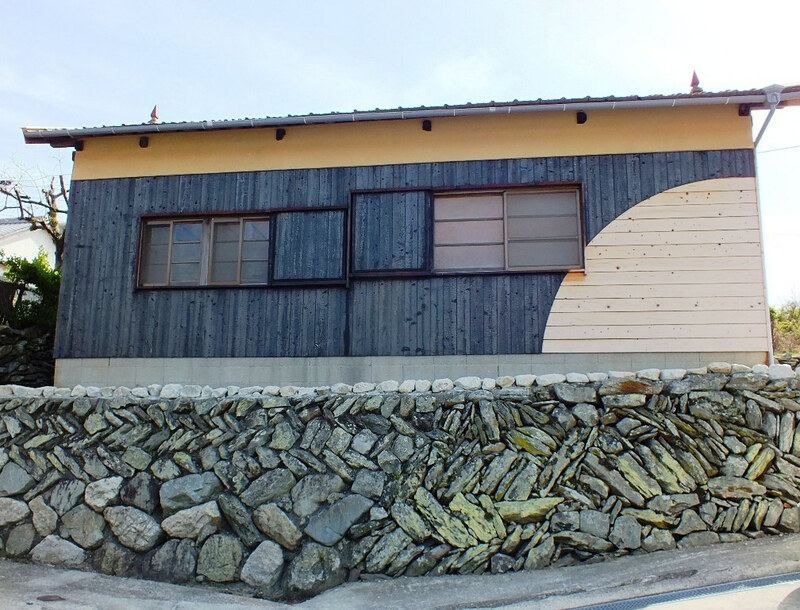 The first summer I worked with the interior of the shed, repainting the dirt walls with mud and painting one white arc form on the east side by mixing granite dust from a quarry in Fukuda (northern tip of Shōdoshima) and one black arc form on the west side with dust from a quarry in Kōnoura (western tip of Shōdoshima). I also repaired the floor so the space was more welcoming and people could have tea, relax and converse there. While spending time in the house and working, local elderly people told me stories about how the structure had been used as a break room for quarry workers in the town for many years. They held New Year’s parties, tea breaks and many other events in the house. I realized the structure itself was full of a rich history beyond its recent usage as a storage shed. There were stories contained in the pillars that held the building together since its birth. I realized my artwork could revive this gathering site, this time as a public space for people to share music, art, culture and stories. I was astounded by its simplicity with no running water, no electricity and of course no internet. These things are inconvenient in our daily lives now and the house would be impractical to live in, but in fact it is much closer to nature and has a charm in its rough character. I found ways to link the interior and exterior spaces with the surrounding environments: the arc shape on the eastern wall could only become circles when seen together with the earth, and the arc on the western wall could only be completed when connected with the sky. 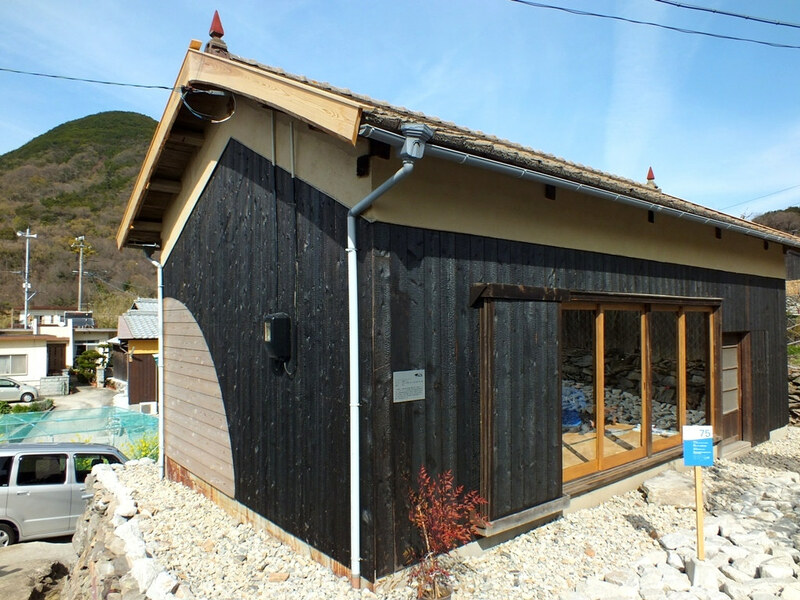 During 2011 I stayed on Shōdoshima for four months and worked primarily on the exterior of the house. I felt the urge to create a system whereby the community could re-inhabit the building itself. As we peeled off the old wood clapboards I asked people to contribute a hope, wish, dream, memory or whatever they like on a piece of paper. These drawings were made by children in Kamo, elderly people across Mito Peninsula as well as visitors from faraway places. As these wishes were pasted to the exterior mud walls, the walls were covered with yakita (burnt wood clapboards). The wishes could only be seen for only a moment then they were part of the structure itself and out of sight. Precisely because the wishes cannot be seen they must be felt. Each of the personal notes reflect on existence. All those who participate in this artwork bring the house back to life. If participation ends the house may fall back to the ground as many of the other empty houses are doing nearby. Returning to earth. This process was full of gatherings at the house where people recollected memories, shared stories and met others who they would not normally converse with. People from different towns came together to share something unknown. 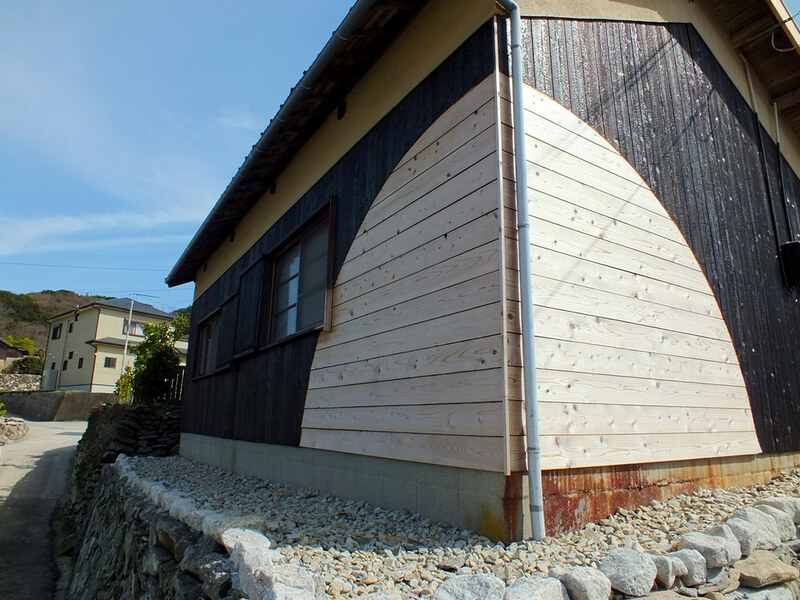 The round arc shape on the exterior made with raw wood clapboards faces the sun setting in the west and that is where the name “sunset house” comes from. In 2013 I worked intensively on the garden over a period of two months. I say “garden” but actually it was a dirty lot that was used for burning garbage and other messy labor. When I arrived there were plants covering most of the surface, but not much love. It was dirty in the sense of being replete with things that we no longer want. I wanted to return it to dirt that is more natural, in tune with the surroundings and full of nourishment. 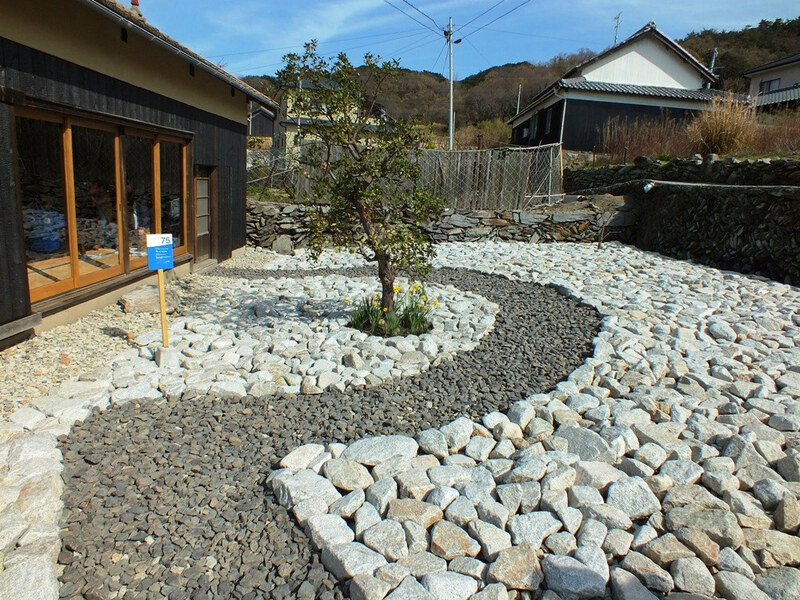 So I envisioned a stone garden made entirely of local materials from Shōdoshima. 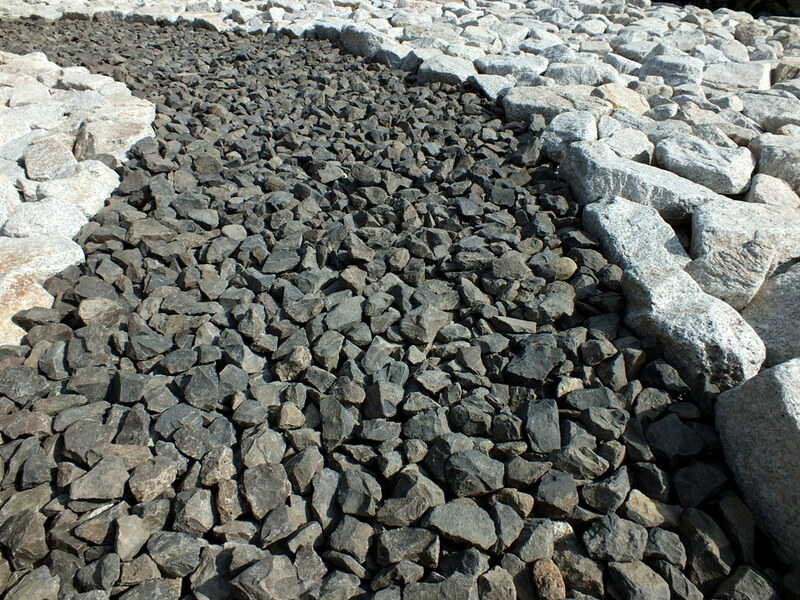 The black rocks on the pathway are basalt stones from the now extinct stone quarry on the outskirts of Kōnoura. The white stones are granite from a currently operating quarry in Fukuda. On the white rocks I asked visitors to record a fear, a worry, something they are stressed about or a difficult emotion on the underside. Then these stones were turned upside down into the garden to become the way they look now. People wrote their feelings in words and images on the stones. It was not about the quantity of stones but the quality of each person’s contribution. As all these people put their heart into this effort, I felt all of these negative feelings could transform into something positive. The garden of garbage became a garden of light clouds because of everyone’s creative expression. Out of these difficult emotions came nourishment for a new atmosphere where the house floats up in the air. 4. What can you tell us about its future? The future of this artwork will include more events that will grow together with the community and local landscape. I am now working on a plan for renovating the rooftop as well as the stonewall which is on the south edge of the garden. These two steps are being developed with community participation from beginning to end just as all the other steps for creating this project. In each step thus far I have felt the power of language as a living component of our existence. That is why the subtitle for this artwork is “Language as the house of Being”. This symbolizes the words I use to communicate with the community and the words they use to talk with me. Not only in conversation and obvious correspondence but also in their personal reflections which are now buried in the walls and garden of Sunset House. These words cross national, cultural and local borders to become a connective tissue that helps us realize a shared existence. Without them this house would not stand the way it is. Each of us creates and nurtures something with the words we use each day. Art can show us how these links are so important and provide methods for how to cherish them. It may not last forever but it will become whatever we put into it. Thanks a lot James, both for answering my questions and for the House itself. It represents for me one of the artworks that really matter, as it is intrinsically part of its community that it helps revive. It does so, not just by attracting visitors, but by changing it while respecting it, and – more important – by involving the member of this community. 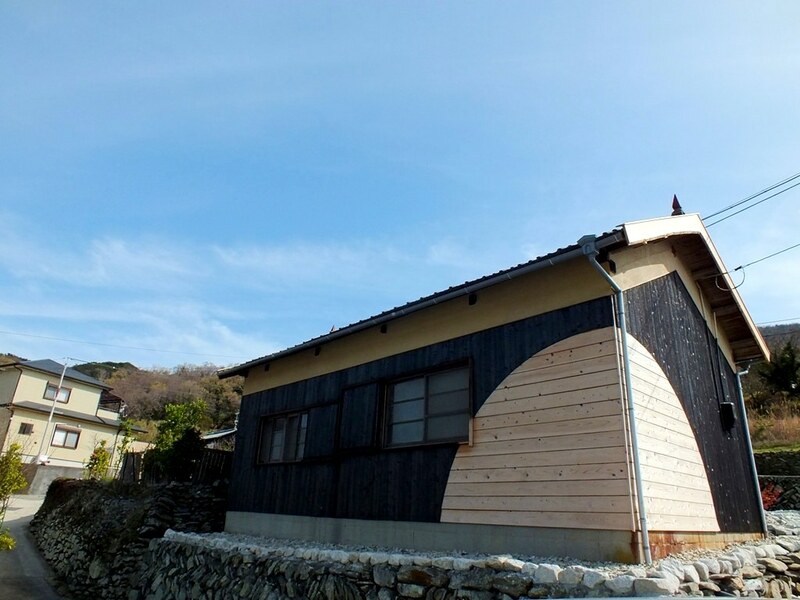 Let’s hope you will be among the next to see and experience the Sunset House, as well as the Kōnoura community, who is – in my opinion – one of the most welcoming of the area, on par with Ogijima and Teshima communities. Sunset House: Language as the house of Being is open every day from 9.30am to 5pm. Admission is free the first time with an Art Passport during the sessions of the Triennale, 300 yen for subsequent visits, or in between sessions. 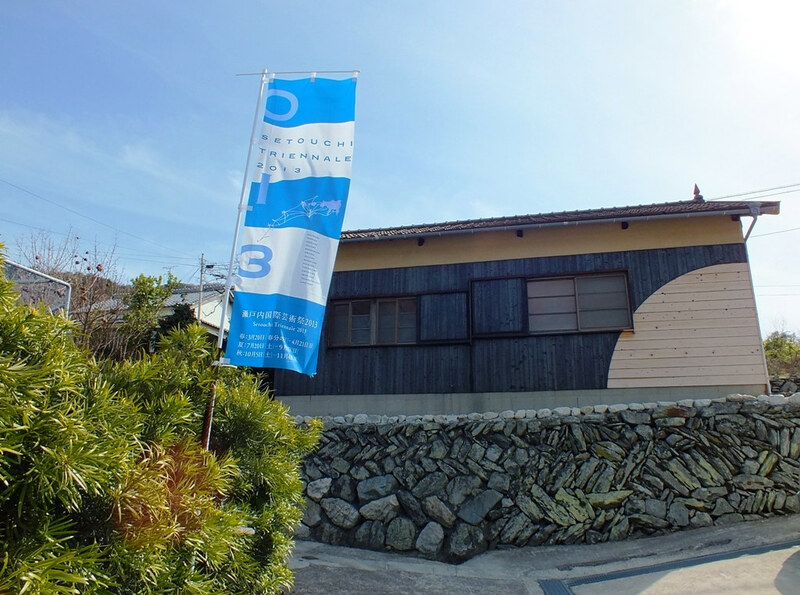 Finally, if you can go to Shōdoshima and Kōnoura, this Saturday August 31st, know that James Jack will be present in the Sunset House and will give a talk and lead a discussion about the house and more. Unfortunately I won’t be able to attend, but if you can, it would be silly to miss it.